So, once the shafts were drilled, it was time to play the waiting game. 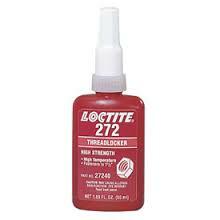 Loctite Thread Locker! High Strength! High temperature! Now they should be really sticking in there! But wait…. if I can’t get the motor hubs off .. what happens if the screws holding the motors (that are right underneath the big hubs) comes loose, I can’t fasten them… Better loctite them down as well! (medium strength thread locker this time around). Hubs in place, sticking really hard. I almost completely destroyed a hex screw trying to (by force alone) unscrew a grub screw once set with the high strength thread locker. Not gonna happen. 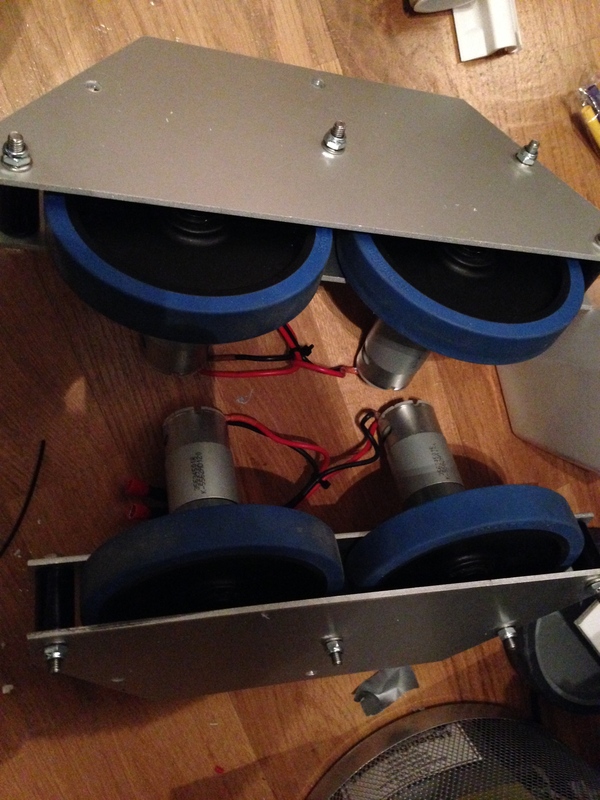 Last step for the feet: screw the motor plates together, and also add a small holder for the bottom of the white insert. OH, and before you ask: “Isn’t that James Short’s design on the motor holders?” Let me clear up this once and for all. It is not. Not one bit. In fact. James will see this for the very first time after these are posted, and invent a time machine, go back in time, and make a set that looks 99% identical, make a blueprint off them, and send them to my mailbox in the past, so it looks like he might have emailed me the plans for his, and then, based on those, I’ve made these, with just a tiny, minute difference (that he even will be so cleverly evil to put into his blog post about his motor holders that he should have done (again, posted in he past through time machine so it looks like it predates mine)). I’ve also replaced the center wheel to the same type of wheel I had previously, as it lifted up the center foot better from the ground, and should work great with these wheels. Step three of this, is to drill upp the holes in the styrene ankles. I suspect (well .. quite strongly, in fact, since I just drilled them freehand without any pillar drill or anything. Basically eyeballed it) that the holes through the ankles of my droid is not perfectly perpendicular to the surface they are in. This might be why my droid is veering off to the left all the time when driving! My solution for this is simple. The bolt going through the ankle is 8mm, I’ve got a 10mm metal tube inside the hole through the ankle to protect the styrene. I just need to firmly stick the ankle to something straight, drill a new, bigger hole in its place, make sure the plastic doesn’t try to veer off in any direction (Might even mix up a batch of styrene putty and pack tight into the ankle hole and let dry first, to make sure this doesn’t happen easily. ), then insert a new metal insert into this bigger hole. That is another job for another day. I can do the prep job, but drilling the holes and making new inserts on a lathe is something my friend Anton will have to help me with.